Omorovicza’s Complexion Enhancer is a gorgeous skin perfector with a matte finish rather than the ‘dewy, glowy’ finish that many of these ‘almost tinted moisturisers’ seem to give. It’s also not quite as sheer as most (I’m thinking Laboratoire Remède’s UV Coat, Cosmetics a la Carte’s Skin Veil and Origins’ VitaZing) so it actually gives a reasonable amount of coverage. It’s pretty dark, so I’d say that it’s best for fair-medium to medium skin tones rather than faces of the very pale, but for creating a ‘hint of colour’ on bare summer faces it’s ideal. 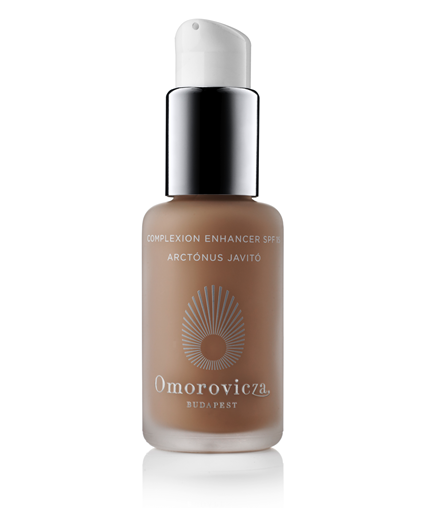 Omorovicza ain’t cheap, which is why this Complexion Enhancer has the honour of gracing the Moneybags Monday page! You do get 50ml, so it’s not the tiniest quantity on earth, but it still belongs firmly in the Luxury category! If you’re looking for an ‘all-in-one’, though and have cash to flash, then this might be your answer: it moisturises nicely, it contains SPF15 protection from both UVA and UVB rays and it gives just the right amount of coverage for a ‘no makeup makeup’ product. Omorovicza’s Complexion Enhancer costs £74 from Cult Beauty HERE!